Let's look at the most recent week of data that I had access to. I categorized all respondents based on their status during the prior four weeks. Now that we've segmented the users, let's look at key performance indicators in the most recent week. Mega Participants speak for themselves, so to speak! Twenty whopping tweets, and a total of 2,306 tweets ... nearly 40% of all volume coming from just 112 of 1,250ish participants. Think about that one for a moment. It is important to look at the type of tweets, and compare them to the audience who issues them. Statements skew to infrequent participants. Re-Tweets skew to infrequent participants. Amplifications skew to other participants. Conversations skew to mega participants. 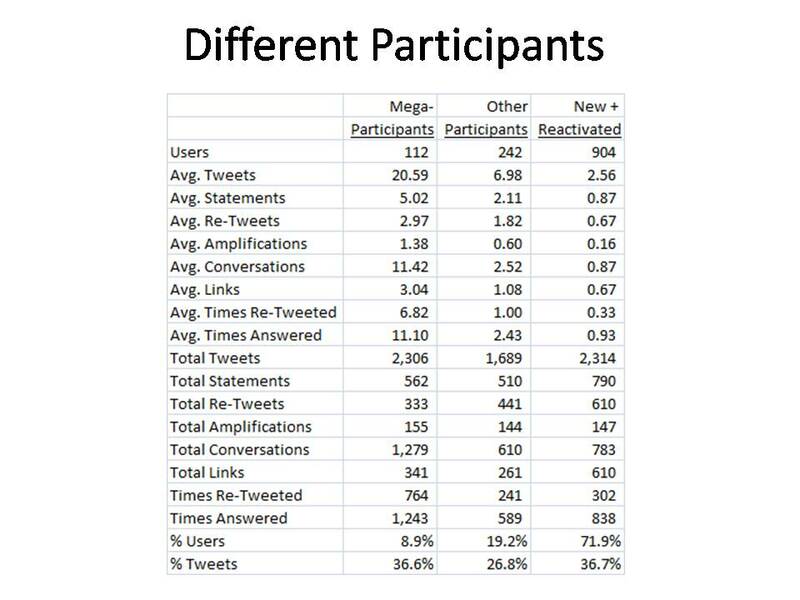 Times re-tweeted skew to mega participants. Times answered skew to mega participants. It probably shouldn't come as a surprise that mega participants thrive on conversations, and are most likely to be re-tweeted or answered. And it probably shouldn't come as a surprise that infrequent participants make statements and re-tweet other statements. 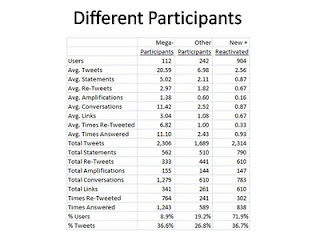 Most important is the disproportionate influence that mega participants have on the total conversation ... not good, bad, or otherwise ... just interesting.